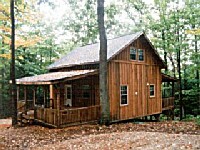 Turtle Hill Cabins is located in the deep woods bordered by state land with the famous Buckeye Trail crossing the corner of the property. From bucks to butterflies and turkeys to turtles, wildlife abounds! The Hemlock includes a fully equipped Kitchen, Fireplace, Hot Tub, Full Bath, and 2 loft bedrooms with Queen size Pillowtop Mattresses, and other amenities to enhance your stay. Kept sparkling clean by owner. Very quite and private. 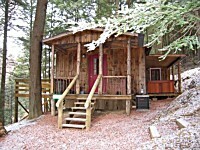 Romatic couples cabin with full kitchen, hot tub, fireplace, firering, plus more. Overlooks ravine with babling brook and wonderful views of wildlife life in a natural setting.